ETİ started “ETİ ÇEKÜL Cultural Ambassadors” social responsibility project between 2008-2012 in cooperation with ÇEKÜL Foundation to preserve the cultural values of our country and to pass them on to future generations. Every year during the project, children received theoretical and practical training prepared by the national and local experts and learnt the unique cultural values of the regions in which they live. They learnt the traditional life culture, natural life, urban architecture and archeology of their cities. They learnt the elements which constitute the identity of their cities such as a historical building they walk by every day, a local song they listen to or a dish they eat, with their values in the life. 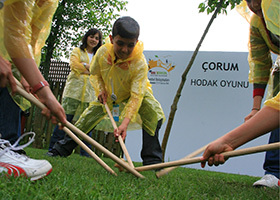 The children who became voluntary “cultural ambassadors” of their cities met in “Istanbul Meetings” held at the end of every academic year and developed their skills of team work, sharing, communication and representation as well as preserving the cultural values and passing them on to the future generations. At the end of five-year “ETİ ÇEKÜL Cultural Ambassadors Project”, one of the longest-termed social responsibility projects of Turkey, approximately 18.000 Cultural Ambassadors who were 6th grade students were trained in 77 cities of Turkey. Cultural Ambassadors visited approximately 1.200 classrooms throughout Turkey and told primary school students about cultural values. 77 clubs led by Cultural Ambassadors were opened in 77 cities. Clubs worked to reach cultural values to the large masses with the research units of geography and natural life, archeology and historical characteristics, architectural characteristics and life culture, information sharing meetings, brother and sister presentations and peer education classes in various civil society organizations. During the project, an average of 3 teachers taught in each city, and thus total 231 voluntary teachers worked in the cities and gave 2.800 hours of education. Cultural Ambassadors from all over Turkey met in Istanbul every year with a theme. • In 2008, Cultural Ambassadors held meetings under the supervision of expert teachers in Istanbul Meetings for one week, and discussed and exchanged ideas on the concepts of “city – culture – identity relation”, “cultural diversity”, “natural – historical – cultural heritage and city” as well as playing creative games, participating in workshops and taking culture trips. They told each other about their own regional values through performances, shows and presentations. Cultural Ambassadors also had the opportunity to learn about Istanbul having very important cultural and natural heritage through the trips and presentations. 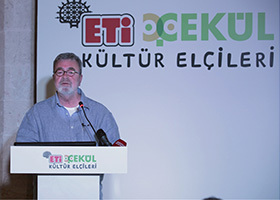 Candan Erçetin and TV producer and journalist Fatih Türkmenoğlu who voluntarily supported the project met with Cultural Ambassadors. • In 2009 Istanbul Meetings; The Cultural Ambassadors Choir sang a potpourri representing 7 regions together with Candan Erçetin under the baton of Musical Director Haluk Polat. Then, 300 Cultural Ambassadors organized a “Culture Walk” on İstiklal Street in Taksim and shared Istanbul Declaration with the public. • The theme of 2010 Istanbul Meetings was “street games”. Cultural Ambassadors played the street games of our culture with pleasure which have educated the generations from past to present, taught them to share, find solutions, reconcile, work as a team and help others, contributed to their personal development and communication skills and improved their imagination. In Istanbul Meetings hosted by Bergüzar Korel, a short film in which celebrities such as Kenan Doğulu, Sunay Akın, Sema Şimşek, Burak Hakkı and Saba Tümer, known and liked by the society, talked about the games they played in their childhood was screened. The project’s voluntary ambassador artist Candan Erçetin and other prominent names including Prof. Dr. Doğan Cüceloğlu also participated in the event. • In 2011 Istanbul Meetings, the theme was “street games” which begin to be forgotten due to technological developments and intense urbanization. Project’s supporter Okan Bayülgen visited the cities where the Cultural Ambassadors were educated and he took photos of many interesting street games and displayed the unique street games of Turkey’s various cities in his “Disappearing Street Games” exhibition. Okan Bayülgen’s photographs of street games were compiled in a booklet to eternalize them. 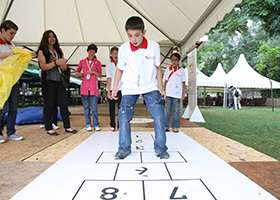 The booklet titled Our Cultural Values for Preservation: “Street Games” included the photos of unique street games of seven cities and the texts written by Okan Bayülgen about the games. • In the last year of the project, Cultural Ambassadors met in Gaziantep with the theme of “Local Tastes”. In Gaziantep meeting moderated by the famous gourmet and author Mehmet Yaşin, local dished of different regions were cooked. The recipes of these dishes were compiled in a booklet.